Magic: The Gathering - Games Count! Aldo is a certified Gateway Coordinator, qualified to teach and oversee games of Magic: The Gathering. This game, with its elaborate cards and complex rules, is a mystery to most adults, and a particular favorite among 8 to 14 year old boys. 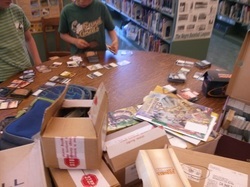 Aldo has assembled many decks of cards, and he is happy to loan them to children who do not own decks or would like to try playing with a deck of a different color. Whether helping children unfamiliar with the game, matching children of like ability, fielding questions, or settling disputes, Aldo keeps this complicated game orderly and on track. Here is a picture of one of our events. On Sunday, June 10th 2018, we held a draft in our garden. Ken did quite well at the event, defeating all challengers.